Fidel Castro of Cuba, Julian Messner, 1991. 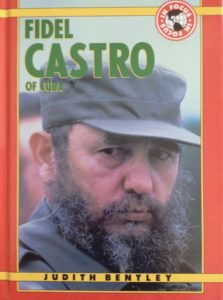 Fidel Castro was still young–only 63–when I wrote this biography in 1991. He was an athlete (baseball), a revolutionary, a national leader, and a communist dictator thumbing his nose at the United States. Always, he was charismatic and controversial. He died in 2016 at the age of 90. This book is out of print but available on used book sites.